What do you think of Donald Trump being the president? It’s an execrable thing. He is the worst we have ever had, by far. The man has no morals; he is wholly dedicated only to the god Trump. Nothing concerns him except what he believes will be beneficial to him. (2) Dictatorial power: He has demonstrated an extreme dislike, even hatred, for the limitations the Constitution places on the powers of the presidency. He despises the courts, unless they rule the ways he wants, and hates even a Congress which is run by his own party for not rubber-stamping his every whim and fancy. 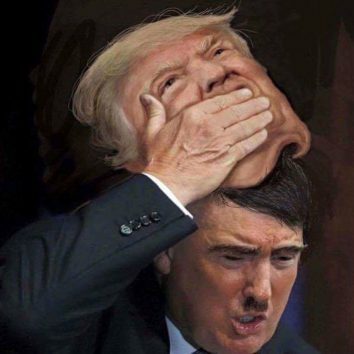 (3) Forcible suppression of opposition: He is actively searching for ways to circumvent or stop a legitimate investigation into criminal behavior by members of his administration and hopes to control the free press, to punish them for exposing damaging truths about him and his administrations. (4) Control of industry and commerce? He exhibits less of this tendency specifically, but so far, industry and commerce are all in bed with him, so there is little reason for him to complain. “Hitler has gone but his progeny are very much alive. In Hungary, they are calling for a register of Jews to be drawn up. One, a mass murderer, is languishing in a Norwegian jail. A few are pushing their leaflets through the front doors on east London housing estates. “There is one thing political extremists crave more than anything else and that is entry to the mainstream – and by branding such people ‘socialists’ or ‘conservatives’ we unlatch the door and pull back the bolt.